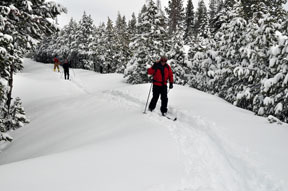 This pleasant tour on a road is ideal for skiers seeking a short, easy tour. Enjoy lunch on the flank of Chipmunk Bluff while taking in the view to the east of Tells Peak and the Crystal Range; Tells Peak is the pyramid-shaped peak. Be aware that the last 75 vertical feet to the summit of Chipmunk Bluff are not skiable and are dangerous to climb due to the precipitous angle and the presence of cornices along the summit. You can combine a tour to Chipmunk Bluff with a tour to Berts Lake as described in the Berts Lake and Chipmunk Loop tour. There are two trailheads adjacent to Loon Lake Chalet. To locate the one to Chipmunk Bluff, stand in front of the Chalet facing the front door and extend your right arm out to your side; it will be pointing directly at the Chipmunk Bluff trailhead. From the trailhead (1) ski southwest and then southeast on a snow-covered road for a total of 0.5 mile until you reach a power line (2). Continue to ski south on the snow-covered road for 0.8 mile until you reach an obvious location from which you can leave the road and angle up toward the base of Chipmunk Bluff (3). 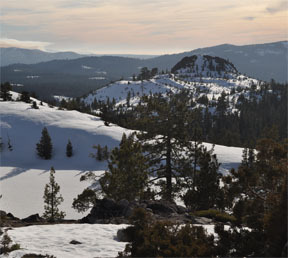 Leave the snow-covered road and angle up towards Chipmunk Bluff for 0.1 mile until you reach the ridge to the northeast of the peak (4). Retrace the route for 1.4 miles back to the trailhead (1). 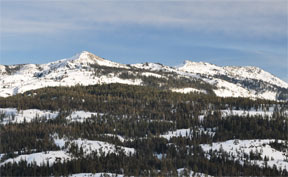 As an alternative, start your return trip by skiing northeast along the ridge before getting back on the road.